Airlie Gardens is excited to host their seventh annual art exhibit, HeART of the Gardens! 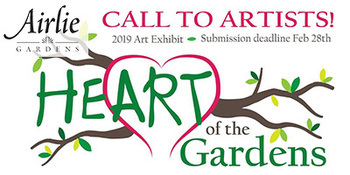 Airlie is currently looking for artists, or teams of artists, to decorate one of 10 over-sized fiberglass heart models to be displayed throughout the gardens July-October 2019. Applications are due by Feb 28. Sponsorship opportunities are also available. For more information & application visit AirlieGardens.org. Kings Grant Park has an awesome new playground, basketball court & picnic shelter! Field drainage improvements are underway at Northern Regional Park & Eaton Elementary School. Plans for Echo Farms Park have been submitted to the city for technical review, which is expected to take about 6 months. The plans include demolition of existing buildings and building a new clubhouse, swimming pool repairs, and a paved walking trail. The Koi at the NHC Arboretum are now swimming in a newly cleaned accommodation. Thank you to the Cape Fear Water Gardens for all your help with this endeavor! Did you know that koi are not to be fed during the winter? When temperatures are low, their metabolisms slow down and they are less active. Their need for food decreases and they are unable to properly digest food. Feeding will return in the Spring and fish food will be for sale in the gift shop. Check our online calendar for the Winter Tram Schedule or call (910) 798-7700.